Background and objectives: Ankle fractures are painful. Intense uncontrolled postoperative pain may lead to persistent pain and complications. Local anesthetic infiltration into a surgical wound or joint blocks the pain at its origin, and thus it is particularly well-suited for ambulatory surgery. Several studies have shown a clear correlation between increased local and regional anesthesia use and the success of major knee and shoulder procedures in an ambulatory setting. The preferred indication for local infiltration is foot and ankle surgery, as it allows for earlier ambulation and reduces the risk of falls when compared to more extensive blocks of the lower limp. The purpose of this study was to investigate the preoperative use effects of local infiltration of ropivacaine or bupivacaine in pain management after open reduction and internal fixation treatment for ankle fracture. Methods: In this prospective single-blind randomized controlled trial, 93 patients (42 women and 51 men) were randomly divided into ropivacaine (spinal anesthesia + local anesthetic infiltration with 37.5 mg of 0.75% ropivacaine), bupivacaine (spinal anesthesia + local anesthetic infiltration with 25 mg of 0.5% bupivacaine) and control (spinal anesthesia only) groups. All patients underwent open reduction and internal fixation for acute ankle fracture and local anesthetic infiltration was applied before incision. Pain was evaluated using Visual Analog Scale scores at 4, 8, 12, and 24 hours after surgery. Results: Local anesthesia with ropivacaine was better in pain management with a lower Visual Analog Scale score at 4 hours after surgery than local anesthesia with bupivacaine and spinal anesthesia (P < 0.05). At 8, 12 and 24 hours, local anesthesia with ropivacaine was slightly, but not significantly, better than local anesthesia with bupivacaine and spinal anesthesia (P > 0.05). Conclusions: Ropivacaine tends to have a rapider onset of action, longer acting effect, fewer complications, and lower motor block than bupivacaine in preoperative local anesthesia. Ethics and trial registration: This study protocol has been approved by the local ethics committee of IMSS in México (approval No. R-2016-3401-55) and was registered with ClnicalTrials.gov (Identifier: NCT02949674) on October 31, 2016. Musculoskeletal injuries have become increasingly more common in the USA, with approximately three out of every five injuries occurring to this system. Fractures represent the second most frequent injury (25%). Ankle fractures occur in 187 per 100,000 persons every year. Ankle fractures are a common musculoskeletal injury that occurs in a bimodal distribution. Young men predispose to ankle fractures because of high energy trauma and older women predispose to ankle fractures because of osteopenia and osteoporosis. Ankle fractures constitute approximately 10% of all fractures and are the most common surgically orthopedic injury. Supination-external rotation (SE) ankle fractures, also known as Weber B type ankle fractures are the most common ankle fractures and account for nearly 80% of all ankle fractures., A decision for operative or non-operative treatment is based on the stability of the ankle; unstable fractures have a better outcome with surgical treatment than those treated conservatively. Medial instability associated with a lateral malleolar fracture can result from a medial malleolar fracture, a deltoid ligament lesion or a combination of osseous and ligamentous lesions. While isolated lateral malleolar fractures may be biomechanically stable and amenable to non-operative treatment more complex bi- and trimalleolar ankle fractures and syndesmotic injuries often require open reduction and internal fixation (ORIF) to restore the native biomechanics of the ankle and prevent premature joint degeneration. Ankle fractures are painful. Generally, inadequate postoperative pain treatment may affect pulmonary function negatively, developing into atelectasis or pulmonary infections, and prolong recovery. Intense, uncontrolled postoperative pain may also lead to persistent pain. Being female, low educational level, report of illness or chronic illness were found to be predictors of chronic pain in a Norwegian cohort. It has been suggested that preoperative infiltration of local anesthetics provides a greater reduction in postoperative pain than perioperative or postoperative infiltration; nerve impulse block resulting from local infiltration prevents nociceptive impulses from reaching the central nervous system and suppresses the sustained state of hyperexcitability responsible for intense postoperative pain. A clear correlation between increased local and regional anesthesia use and the success of major knee and shoulder procedures in an ambulatory setting has been shown. The preferred indication for local infiltration is foot and ankle surgery, as it allows for earlier ambulation and reduces the risk of falls when compared to more extensive blocks of the lower limp. Local and regional analgesia provides optimal analgesia, especially during mobilization, with significant reduction in using morphine-containing agents and its associated side effects, and faster functional recovery. It significantly reduces the inflammatory reaction at the incision. Local anesthetic infiltration into a surgical wound or joint blocks the pain at its origin – the surgical site itself – without altering motor function. This method is virtually devoid of side effects and it is particularly well-suited after ambulatory surgery. The purpose of this study was to investigate the preoperative use effects of local infiltration of ropivacaine or bupivacaine in pain management for open reduction and internal fixation treatment for ankle fractures. The study protocol was approved by the local ethics committee (IMSS ethical committee; approval No. R-2016-3401-55) on September 26, 2016 and registered with ClnicalTrials.gov (Identifier: NCT02949674) on October 31, 2016. All procedures performed in studies involving human participants were in accordance with the principles of the 1964 Helsinki Declaration and its later amendments or comparable ethical standards. Informed consent was obtained from all individual participants included in the study. This prospective single-blind randomized controlled trial was conducted between October 2016 and October 2017 at the Emergency Room of Traumatology, Orthopedic and Rehabilitation High Specialty Unit Dr. Victorio de la Fuente Narvaez that belongs to the Mexican Security Institute. Ninety-three patients were included in this study. They were adult individuals (≥ 18 years old) with type B ankle fractures who underwent ORIF only through a lateral incision (with or without talar shift) and accepted to participate in the study (informed consent signature). Patients with other injury or fracture (polytrauma), or those who had a history of neuropathy or pain alteration before the ankle fracture, or those with skin injury before ORIF or open fractures were excluded from this study. Patients who did not complete the follow-up or desired terminating the study during the follow-up were withdrawn from this study. The included patients were randomly divided into three groups: ropivacaine, bupivacaine, and control (n = 31 patients per group). All of them were prepared for ORIF. After spinal anesthesia (hyperbaric bupivacaine 0.5%, 7.5 mg, Pisa laboratory, Guadalajara, México), local anesthetic infiltration with 37.5 mg 0.75% ropivacaine (Pisa laboratory, Guadalajara, México), 25 mg 0.5% bupivacaine (Pisa laboratory), or no local anesthetic infiltration was applied in the ropivacaine, bupivacaine, or control groups, respectively [Figure 1]. All patients underwent ORIF with only a direct lateral approach and then simple bandage was applied. Only patients were blinded to group assignment. The analgesic drugs only include non-steroidal anti-inflammatory drugs, precisely acetaminophen 1 g, once every 8 hours, and ketorolac 30 mg intravenously once every 8 hours. Figure 1: Flow chart (CONSORT diagram). We used the Visual Analog Scale (VAS) score,(0 = no pain, 10 = maximum pain) to assess pain in patients at 4, 8, 12 and 24 hours after surgery. Statistical analysis was performed using SPSS version 23.0 software (IBM, Armonk, NY, USA). One-way analysis of variance and the chi-square test were used. All data are expressed as the mean ± SD. A P-value < 0.05 was considered statistically significant. Demographic data of 93 included patients, consisting of 51 women and 42 men, are shown in [Table 1]. Demographic characteristics of these patients were analyzed. 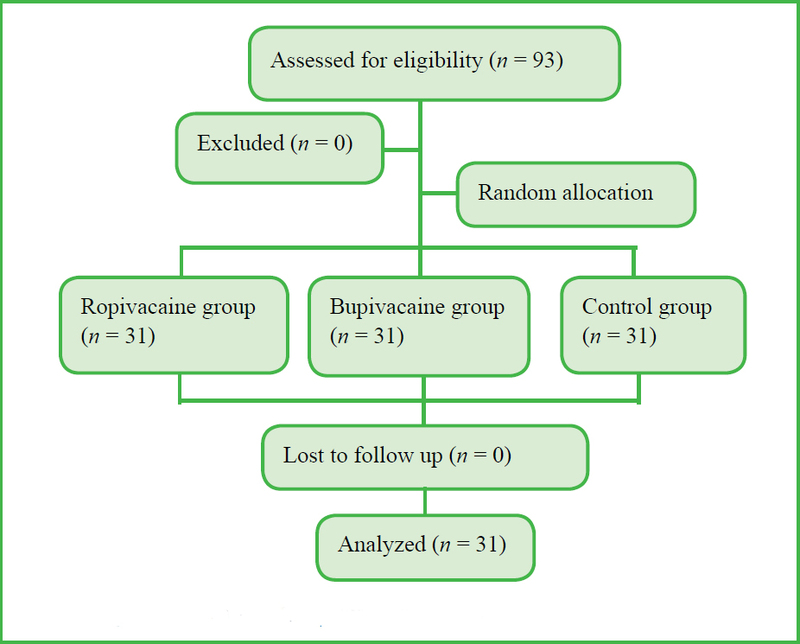 At 4 hours after ORIF, a more obvious analgesic benefit was observed in the ropivacaine group than in the bupivacaine and control groups (P < 0.05). There was no significant statistical significant in the analgesic effect among the three groups at 8, 12 and 24 hours after surgery (P > 0.05) [Table 2]. Preemptive analgesia refers to the analgesic administration before surgical insult or tissue injury. It is based on the concept that central and peripheral sensitizations are the mayor causes of hypersensitivity to pain after injury. Preemptive analgesia can be done with nonsteroidal anti-inflammatory drugs, local anesthetics, cyclooxygenase-2-specific inhibitors, steroids, N-methyl-D-aspartate antagonists, alfa-2 agonist and anticonvulsants. Regional anesthesia has been shown to improve postoperative pain control., Peripheral nerve blocks have long been underused for acute pain management in orthopedic trauma. However, the associated side effects, time required to perform, and lack of the necessary expertise are some of the potential causes for not providing peripheral nerve blocks on a large scale. Common concerns in using peripheral nerve blocks include delayed ability to monitor postoperative neurological function and masking acute compartment syndrome. Ropivacaine has the similar efficiency to bupivacaine but it is associated with a longer acting and fewer complications in the nervous and cardiovascular systems. It tends to have a quicker onset time than bupivacaine (by 2–15 minutes). A clinically adequate dose of ropivacaine appears to be associated with a lower incidence of motor block and faster regression of motor block that stimulates earlier mobilization than bupivacaine. In a randomized clinical trial, patients with femoral neck fractures underwent surgical treatment with internal fixation with two parallel hook pins. The analgesic effects of intraoperative infiltration with ropivacaine followed by six postoperative injections through an intra-articular catheter in 8-hour intervals (ropivacaine group) were compared with placebo (saline group). Results showed that there was no significant difference in consumption of standardized opioid rescue analgesics or pain between ropivacaine and saline groups. With the exception of reduction in nausea in the ropivacaine group on postoperative day 2, there was no significant difference in the occurrence of side effects between two groups. In another randomized clinical trial, patients with femoral fracture underwent surgical treatment with plate fixation, intramedullary device or arthroplasty for a range of femoral fracture patterns. The efficacy of multimodal drug (ropivacaine, epinephrine and morphine) injection versus no injection in pain control was compared. Results showed that the local drug injection improved pain control (as demonstrated by lower VAS score) and reduced narcotic utilization over the first operative day with no observed adverse effects than no injection. Therefore, we believe that multimodal analgesia is a better approach to prevent postoperative pain in patients with acute fracture than no analgesia. A combination of several drugs can be made to have better outcomes. More alternatives should be investigated in patients undergoing ORIF for ankle fractures like using a higher dose of local anesthetic, local anesthetic combinations or multimodal analgesia itself. To conclude, local infiltration with ropivacaine in ORIF for acute ankle fractures reduced pain at 4 hours after surgery better than local infiltration with bupivacaine. However, the efficacy in pain control was not significant between these two analgesia methods. We believe that the most important factor to reduce pain in patients with acute ankle fracture is the fracture fixation itself. Study design: JLV, JJDLCP, JGA, JMGG, ARÁN, ACV, AKL; study protocol: JLV, AKL; study implementation: JJDLCP, JGA, JMGG, ARÁN, ACV; data collection: JJDLCP, JGA, JMGG, ARÁN, ACV; statistical analysis and data discussion: JLV and AKL. All authors approved the final version of this paper. This study protocol was approved by the local ethics committee (IMSS ethical committee; approval No. R-2016-3401-55) on September, 26, 2016, and performed in accordance with the Declaration of Helsinki. The authors certify that they have obtained all appropriate patient consent forms. In the form the patients have given their consent for their images and other clinical information to be reported in the journal. The patients understand that their names and initials will not be published and due efforts will be made to conceal their identity. This study followed the CONsolidated Standards Of Reporting Trials (CONSORT) statement. The statistical methods of this study were reviewed by the biostatistician of IMSS High Specialty Medical Unit Victorio de la Fuente Narváez in Mexico. Individual participant data that underlie the results reported in this article, after deidentification (text, tables, figures, and appendices) will be available. Study protocol, informed consent form will be available immediately after publication. Data will be available for investigations whose proposed use of the data has been approved by an independent review committee identified for this purpose for individual participant data meta-analysis. Proposals should be directed to corresponding author (juanlopez110@hotmail.com). Anonymized trial data will be available indefinitely at mail juanlopez110@hotmail.com. McDonald MR, Sathiyakumar V, Apfeld JC, et al. Predictive factors of hospital length of stay in patients with operatively treated ankle fractures. J Orthop Traumatol. 2014;15:255-258. Tartaglione JP, Rosenbaum AJ, Abousayed M, DiPreta JA. Classifications in brief: Lauge-Hansen classification of ankle fractures. Clin Orthop Relat Res. 2015;473:3323-3328. Orr JD, Kusnezov NA, Waterman BR, Bader JO, Romano DM, Belmont PJ Jr. Occupational outcomes and return to running following internal fixation of ankle fractures in a high-demand population. Foot Ankle Int. 2015;36:780-786. Court-Brown CM, McBirnie J, Wilson G. Adult ankle fractures--an increasing problem? Acta Orthop Scand. 1998;69:43-47. Court-Brown CM, Caesar B. Epidemiology of adult fractures: A review. Injury. 2006;37:691-697. Stufkens SA, van den Bekerom MP, Knupp M, Hintermann B, van Dijk CN. The diagnosis and treatment of deltoid ligament lesions in supination-external rotation ankle fractures: a review. Strategies Trauma Limb Reconstr. 2012;7:73-85. Storesund A, Krukhaug Y, Olsen MV, Rygh LJ, Nilsen RM, Norekvål TM. Females report higher postoperative pain scores than males after ankle surgery. Scand J Pain. 2016;12:85-93. Gurbet A, Bekar A, Bilgin H, Korfali G, Yilmazlar S, Tercan M. Pre-emptive infiltration of levobupivacaine is superior to at-closure administration in lumbar laminectomy patients. Eur Spine J. 2008;17:1237-1241. Beaussier M, Sciard D, Sautet A. New modalities of pain treatment after outpatient orthopaedic surgery. Orthop Traumatol Surg Res. 2016;102(1 Suppl):S121-124. Couper MP, Tourangeau R, Conrad FG, Singer E. Couper MP Evaluating the effectiveness of visual analog scales: A web experiment. Soc Sci Comput Rev. 2006;24:227-245,. Boonstra AM, Schiphorst Preuper HR, Reneman MF, Posthumus JB, Stewart RE. Reliability and validity of the visual analogue scale for disability in patients with chronic musculoskeletal pain. Int J Rehabil Res. 2008;31:165-169. Lopez Valencia J, Koch Leopo A. Preemptive analgesia in orthopedic surgery: a literature review. Clin Trials Orthop Disord 2017;2:144-152. Buvanendran A. Regional anesthesia and analgesia: prevention of chronic pain. Tech Reg Anesth Pain Manag. 2008;12:199-202. Wilson AT. Regional analgesia and orthopaedic surgery. Orthop Trauma. 2016;30:254-264. Elkassabany N, Cai LF, Mehta S, et al. Does Regional Anesthesia Improve the Quality of Postoperative Pain Management and the Quality of Recovery in Patients Undergoing Operative Repair of Tibia and Ankle Fractures? J Orthop Trauma. 2015;29:404-409. Yan H, Cang J, Xue Z, Lu J, Wang H. Comparison of local infiltration and epidural analgesia for postoperative pain control in total knee arthroplasty and total hip arthroplasty: A systematic review and meta-analysis. Bosn J Basic Med Sci. 2016;16:239-246. Theodosiadis P, Sachinis N, Goroszeniuk T, Grosomanidis V, Chalidis B. Ropivacaine versus bupivacaine for 3-in-1 block during total knee arthroplasty. J Orthop Surg (Hong Kong). 2013;21:300-304. Kumar S, Palaniappan JM, Kishan A. Preemptive caudal ropivacaine: an effective analgesic during degenerative lumbar spine surgery. Asian Spine J. 2017;11:113-119. Bech RD, Lauritsen J, Ovesen O, Emmeluth C, Lindholm P, Overgaard S. Local anaesthetic wound infiltration after internal fixation of femoral neck fractures: a randomized, double-blind clinical trial in 33 patients. Hip Int. 2011;21:251-259. Koehler D, Marsh JL, Karam M, Fruehling C, Willey M. Efficacy of surgical-site, multimodal drug injection following operative management of femoral fractures: a randomized controlled trial. J Bone Joint Surg Am. 2017;99:512-519.